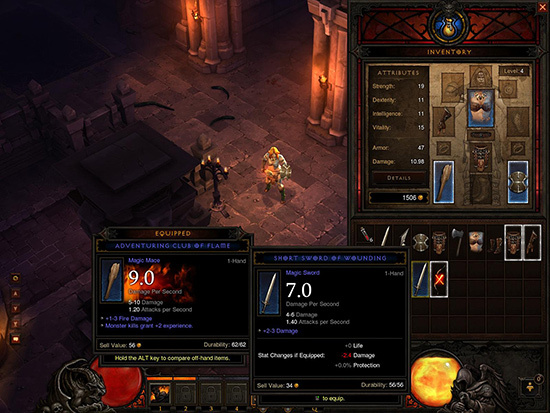 It’s been four years and we’ve come a long way since the launch of Diablo III. 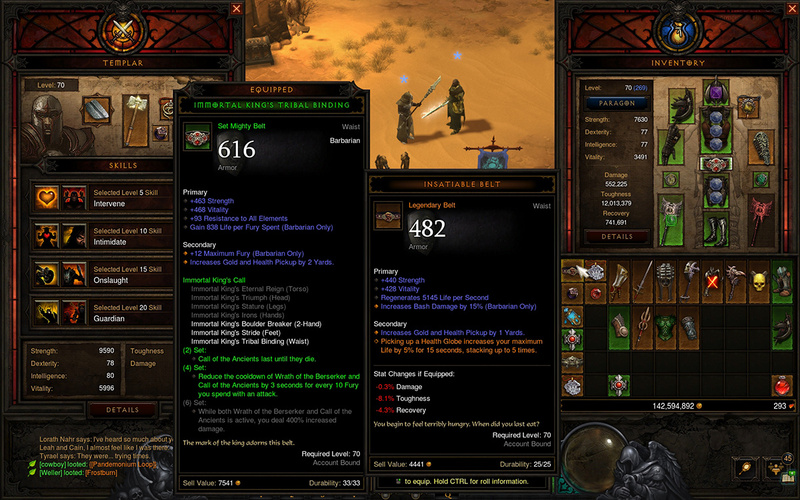 From item overhauls to a brand new class and Act, the world of Sanctuary has never looked so good. However, some changes are larger than they may seem, making a tremendous difference in day-to-day gameplay. 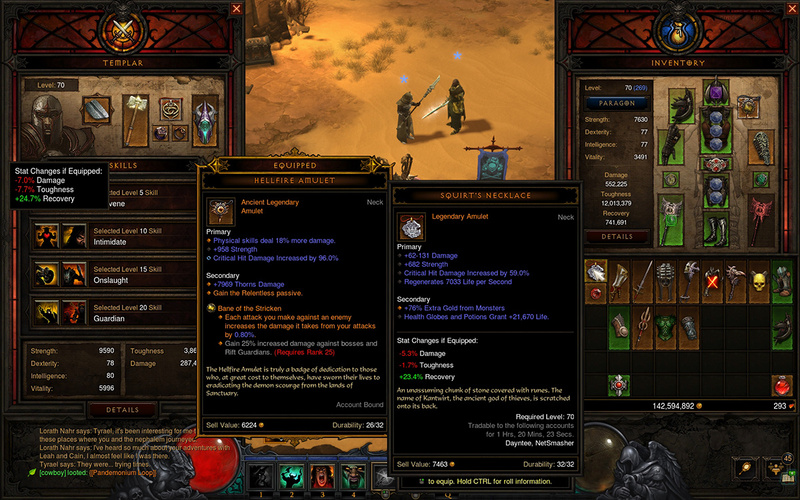 The inclusion and evolution of item comparison tooltips is one such example, so join me in taking a closer look at the development process behind this feature. For many Diablo players, it can be a challenge to decide between potential upgrades. Gear can provide all manner of useful stats and the randomized nature of Diablo loot means upgrades come in countless combinations. Knowing which piece to equip takes great game knowledge, and that can be intimidating for the average or new player. 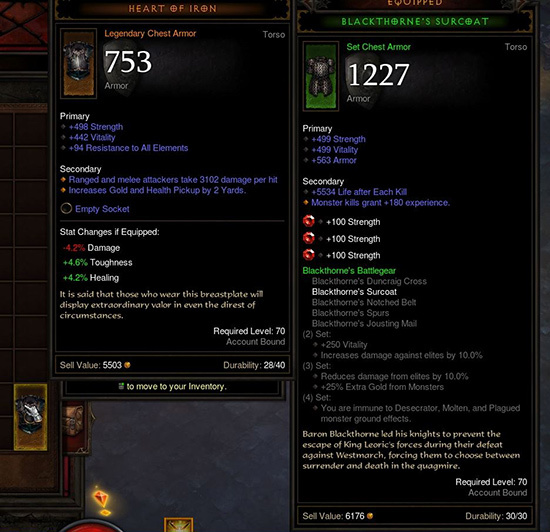 As you may know, itemization has undergone a significant overhaul since the launch of Diablo III. 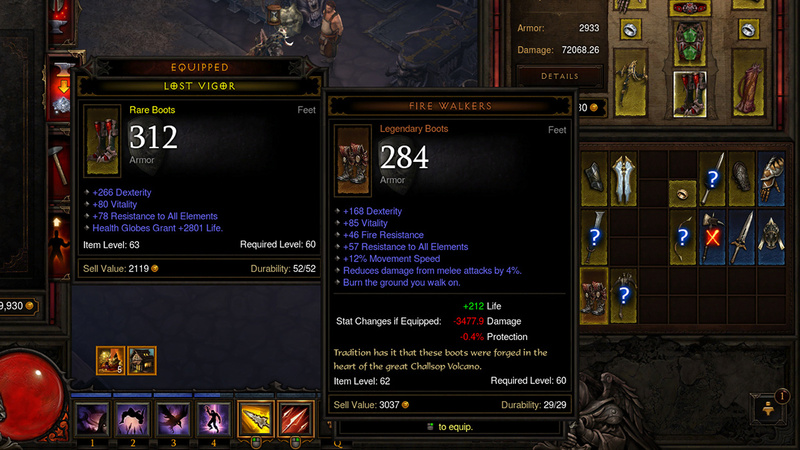 In the beginning, Legendary items weren’t always the obvious choice. That evolution is a different story to tell, but it’s important context to keep in mind. 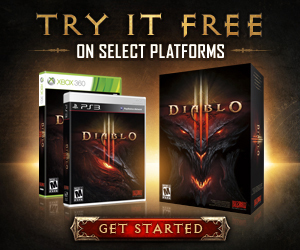 When we were looking to bring Diablo III to console, this presented a unique set of hurdles. Choosing which item to equip can be intensive and, especially where couch co-op was concerned, just didn’t translate well. We didn’t want the fun to stop every time your buddy paused the game to review loot. Keeping the pace of the game smooth was an important goal, and it was important to us that the solution was right for all platforms. Whether in real life or Sanctuary, no one wants to wait around while you pick out which pants to wear. 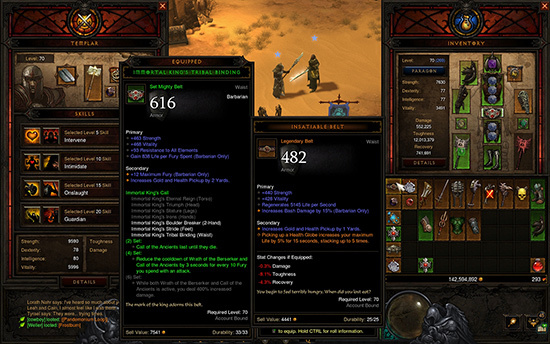 This led us to the basic concept of item comparison tooltips, but the team expressed some concerns. As we were bringing something new to Diablo, we asked ourselves whether it was the right kind of new feature to introduce to the series. 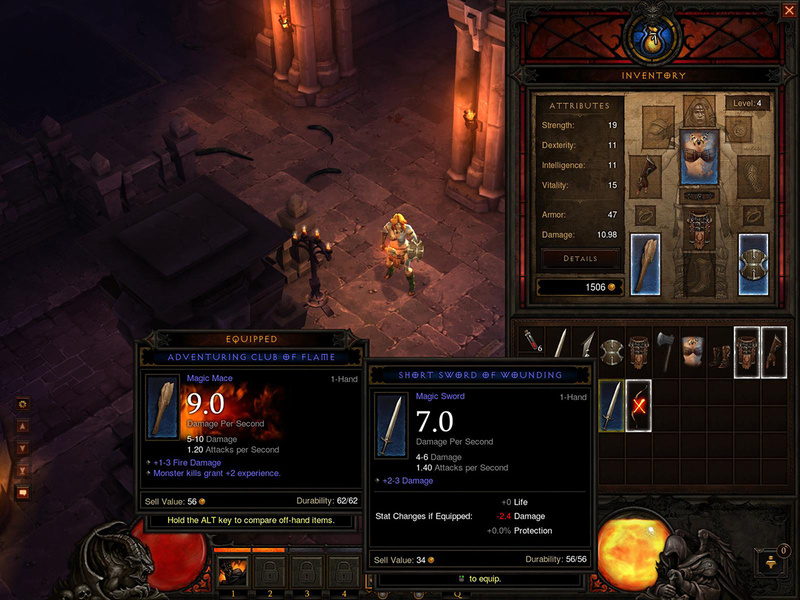 Over a decade had passed since the release of Diablo II and the way players approached games had changed drastically. We decided that it was a great opportunity for iteration and providing a tutorial-like element would only help more players enjoy Sanctuary. More problematic was deciding whether or not it was okay to make some basic decisions on behalf of players. Again, we looked at the new feature as a training tool rather than an instruction manual. Ultimately, we want players to make their own gearing choices and we found that after players had received some guidance through the item comparison tooltips, they began to draw their own conclusions. This basic guidance allowed us to simplify enough to include a fast convenience feature on console in the form of Quick Equip. Quick Equip makes assumptions, but ensures you're not interrupting gameplay. To bring together the item comparison system, we condensed an item’s power into three generalized stats: Life, Damage, and Protection. These were the principles most players followed when making gear decisions, so we stuck with known categories in order for the at-a-glance comparison to remain familiar and easy to grasp for new and veteran players alike. This didn’t hit the mark close enough for us, especially as the game evolved. The information being presented went a little too far in generalization, resulting in stats that were misleading. The advent of Loot 2.0 in Reaper of Souls presented a unique opportunity to fine-tune this feature. Patch 2.0.1 launched just prior to the release of Reaper of Souls, introducing many new systems to the game in preparation for the expansion. One change was replacing the Life and Protection stats with new and better-defined stats. In some cases, it was still tough to tell which items were truly an upgrade. Enter Healing and Toughness. Toughness was intended to be an overall calculation of your Effective Health Pool, or EHP. This is a simplified summary of your hero’s survivability based on stats like maximum Life, Armor, Resistances, Dodge, and other types of damage reduction. Similarly, healing was meant to be an average of how quickly you could regain health. This first pass got the basic messages across, but some of the more variable stats (like Life Per Kill) caused confusing inflations and muddled the information given to the player. So in Patch 2.1.2, we made another change. Some stats needed their weights adjusted while others needed to be excluded altogether. “Healing” was replaced with “Recovery,” and the name was changed to not only better encompass its purpose, but to clearly highlight that change had occurred. The new stat estimated how much Toughness you would expect to recover in an average encounter, and we changed the weighting of certain healing stats to provide a more accurate picture. In our current iteration, these stat summaries provide enough information to be useful to the average player and helps shine a light on how each stat contributes to your character’s overall power. 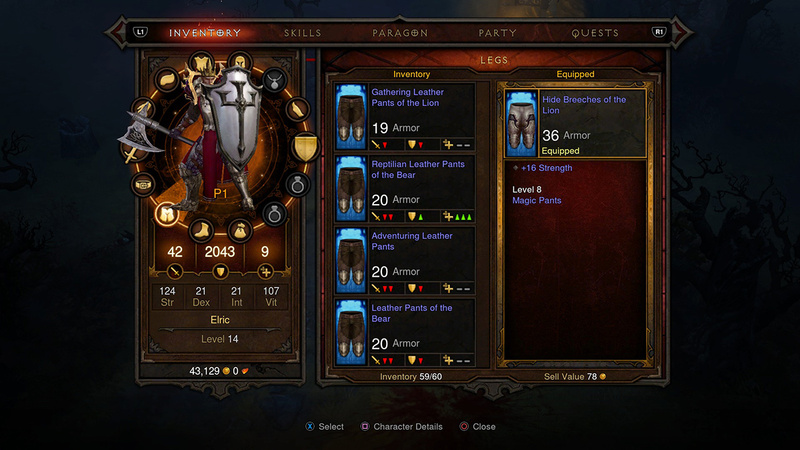 This feature was so useful that we received a lot of community requests for a similar overview of follower equipment. In Patch 2.4.0, we fulfilled this request! Mouse over a valid item in your inventory while your follower's inventory is open and you'll see the item comparison tooltip pop up! Quality of life features are rarely as small as they look. What tweaks to the game have you noticed over the years? What change has made a noticeable impact on the way you play Diablo III? Let us know in the comments, we’d love to hear which features interest you most!